Thanks to the advocacy of two Carnegie Mellon University alumni, Jeff Rosenblum (E'91,'00) and Scott Bricker (DC'99), Boston and Pittsburgh will have safer paths to pedal. The cities are among six chosen by the PeopleForBikes Green Lane Project to receive protected bike lanes. Rosenblum realized the value in biking around Pittsburgh as a student. He has promoted bicycling as a critical element of world-class cities for years — bridging the conversation about street design between planners and engineers, and building a broader-based coalition of interests. "When I co-founded LivableStreets Alliance in 2004, I couldn't have imagined that Boston would be selected by the PeopleForBikes Green Lane Project to join its intensive two-year program to build protected bike lanes," Rosenblum said. Ten years ago, Boston had just 3/8 of a mile of bicycle lanes and was ranked worst bicycling city by Bicycling magazine. 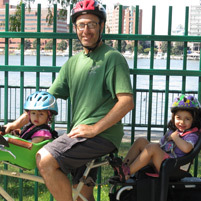 In 2006, Rosenblum worked closely with the chief of policy under Mayor Tom Menino to help the city launch a bicycle program. Working with city engineers and their consultants, Rosenblum has helped them overcome concerns about the design and operations of dedicated bicycle lanes by listening to their concerns and questions and helping them collaboratively develop design solutions. Boston now has 82 miles of bicycle lanes and a Bike Plan that calls for 20 miles of separated bicycle lanes by 2018. "The thing I am most proud of is that LivableStreets Alliance is very fact-based in our advocacy, and I think that comes from my engineering and policy background at CMU," said Rosenblum, who redesigns streets as a transportation planner for the city of Cambridge. Bricker, executive director of Bike Pittsburgh, is equally proud of his CMU education and excited that his city will be getting protected bike lanes, too. "I loved that CMU was an urban campus, and using my bike to get around town, I took advantage of all of the great things that Pittsburgh has to offer — from cafes to small music venues and record shops to museums and parks," Bricker said, pointing to the potential for bike lanes to benefit the businesses alongside of them. Bricker said he had "fantastic professors at CMU who were engaged and determined to see their students succeed." One of their favorite professors was Indira Nair, who later became CMU's vice provost for education. "I was delighted to learn that the visionaries in the cases of Pittsburgh and Boston were Scott and Jeff," Nair said. "They chose very different paths through CMU but had a lot of common sensibilities. Both were young people intent on working collaboratively and on making a difference in the world by pragmatic action, particularly through bringing people to habits that are friendly to the environment." CMU's Pittsburgh campus has numerous bicycle racks and four maintenance stations. The university often partners with Bike Pittsburgh for activities. National Bike To Work Day is being celebrated on the campus Friday, May 16, with a Zero Waste Breakfast from 7:30 to 9:30 a.m. on the walkway outside the Jared L. Cohon University Center Merson Courtyard. University police will be on hand to register bicycles. Bike maps, Biking 101 Guides and other information about summer biking events will be available. Riders will be encouraged to sign up for the CMU team participating in the National Bike Challenge, now through Sept. 30. Both Bricker and Rosenblum serve on the board of directors of the Alliance for Biking and Walking, a coalition of over 200 groups throughout North America whose mission is to create, strengthen and unite state and local bicycling and walking advocacy organizations. "The answer to getting people more interested in biking was not to talk about it directly," Rosenblum said. "What we talked about was the importance of bringing young people into the city and economic viability. Today's instant-messaging generation doesn't want to drive to the city and sit in traffic." Bricker added, "Bikes just make so much sense." He uses his bike to get to work, the grocery store, the farmer's market, restaurants, cafes, bars, the movies and to visit friends. "The best part is it's door-to-door service, and I get to smell the roses along the way."